This year again, Free Comic Day was a huge success in our store. AfterShock Comics HOWARD LOVECRAFT’S BIG BOOK OF SUMMER FUN! Thank you to everyone who dropped by at our Montreal store. 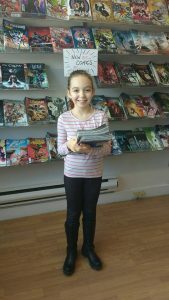 For those of you who did not come, here’s a picture of one of our young customers with a HUGE pile of FREE comics.